Eye tracking is an enormously informative research tool. 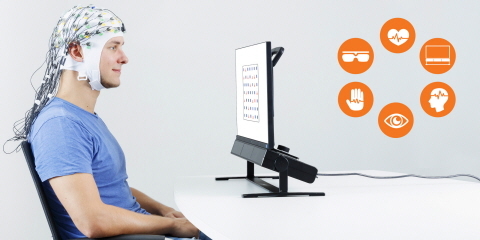 It is a technique that can measure eye movements with high accuracy and precision providing unique insights into cognitive processes and attentional states. In other words, what we notice and how we look at them can reveal a great deal about how we process the visual world. It is well established that the study of gaze can lead directly to important insights about visual attention with respect to interfaces and images and the tasks and the activities which engage us. There are, however, other aspects of experience and perception that are more elusive to capture in gaze behavior. And that’s where biometrics comes in. Adding an additional data stream to eye tracking can provide more dimensions of information and thus support richer and more nuanced findings. It can also make conclusions stronger. For questions about visual impact and basic attentional processes, a technique such as eye tracking is a sine qua non for understanding our reactions and perceptions. It is also a powerful tool for differentiating performance for designers and researchers in a multitude of human-computer interaction fields. But as useful as eye tracking can be for probing the “how, what, and where” of looking, a definitive picture of the “why” underlying visual performance can benefit from the application of a corroborating or triangulating technique that more directly accesses the emotional or mental side of the experience. Specifically, this means measuring the response of the human nervous system Some techniques in this class include galvanic skin response, GSR, (also referred to as electrodermal activity) and electroencephalography (EEG). What emotion is my participant experiencing? Are they happy, sad, angry? Are they feeling frustration during a task? How strongly are they feeling this emotion?